On 3 May at a Spartacist dayschool in London we celebrated the 30th anniversary of the founding of the British section of the international Spartacist tendency (iSt), the forerunner of the International Communist League. The Spartacist League/Britain was founded in 1978 as a fusion between the London Spartacist Group and the Trotskyist Faction (TF), which split from Alan Thornett’s Workers Socialist League (WSL), one of many pseudo-Trotskyist groups in Britain at that time. The fusion was hailed in the first issue of our newspaper Spartacist Britain (April 1978) as the “rebirth of British Trotskyism”. To mark the anniversary, Workers Hammer (as the paper was renamed in September 1984) is reprinting below the document “In defence of the revolutionary programme” which appeared in that first issue as one of three programmatic statements issued by the TF in the process of being won to the authentic Trotskyist politics of the Spartacist tendency. As a document in the struggle to forge a revolutionary party on the basis of Marxist principle and programme, it retains its validity today notwithstanding the enormous political changes in the world since that time. The London Spartacist Group had been established in late 1975 by the iSt, with a perspective of revolutionary regroupment through polemically engaging with the myriad of ostensibly Trotskyist organisations in Britain. Central to this perspective was the fight against Pabloism, the revisionist current which had programmatically destroyed Trotsky’s Fourth International (FI) in 1951-53. Pabloism was characterised by a renunciation of the need for revolutionary leadership of the working class, ie Trotskyist parties, and an adaptation to the existing social-democratic, Stalinist and petty-bourgeois nationalist leaderships. The Spartacist tendency’s struggle to reforge the Fourth International by drawing hard programmatic lines went against the grain of the British fake-Trotskyist milieu which operated as pressure groups on the Labour Party, particularly by tailing the Labour “lefts”. As Leninists, our strategic perspective was to split Labour, a bourgeois workers party, winning its working-class base to revolutionary communism. Our comrades fought for political clarity as seen in the discussion in 1976 on the Irish question, dealing with the national question in cases involving geographically interpenetrated peoples, which is codified in “Theses on Ireland ”, printed in Spartacist [English edition] no 24, Autumn 1977. The founding of the Spartacist League/Britain represented a significant extension to the iSt in our struggle to reforge the Fourth International, not least because of the existence in Britain of Gerry Healy’s Socialist Labour League (SLL), (later known as the Workers Revolutionary Party — WRP), which falsely laid claim to Trotskyist orthodoxy and to the fight against Pabloism. Politically confronting and defeating the Healyites was a key task of our organisation. The iSt originated as the Revolutionary Tendency (RT) that was expelled in December 1963 from the Socialist Workers Party (SWP) in the United States. The RT was formed in opposition to the SWP’s abandonment of the fight for a Trotskyist party in Cuba, expressed by the majority’s uncritical embrace of the pettybourgeois guerrillas led by Castro and Che Guevara. Against this the RT insisted that the Cuban regime is qualitatively similar to the one that emerged in the Soviet Union after the Stalinist bureaucracy usurped political power in a political counterrevolution that began in 1924 and was consolidated over the next several years. The RT and its successor, the Spartacist League, were unique in maintaining that Cuba was a bureaucratically deformed workers state and required a proletarian political revolution to sweep away the Castro bureaucracy, establishing organs of workers democracy and installing a revolutionary internationalist regime. The SWP’s line on the Cuban Revolution mirrored the wave of revisionism a decade earlier in the Fourth International. Founded under Trotsky’s leadership in 1938, the FI had been profoundly disoriented by the post-WWII overturns of capitalism under Stalinist leadership. Mao Zedong’s peasant-based People’s Liberation Army seized power from the collapsing bourgeois Guomindang of Chiang Kai-shek in 1949, leading to the establishment of a deformed workers state. Similar peasant-based social overturns led by Stalinist forces triumphed in Yugoslavia, North Korea and North Vietnam (extended to the South in 1975 after the defeat of US imperialism by the Vietnamese workers and peasants). Capitalism was overturned in several states in Eastern and Central Europe under Soviet occupation following the Second World War. While different processes took place in each of these various countries, what they all had in common was the absence of the working class contending for state power. The result was the creation of bureaucratically deformed workers states. Michel Pablo, then head of the FI, responded to the postwar social overturns by repudiating the central importance of a conscious revolutionary leadership. Pablo asserted that “The objective process is in the final analysis the sole determining factor” and relegated the role of Trotskyism to liquidating into or at best being pressure groups on various Stalinist or social-democratic parties. This revisionism led to the destruction of the Fourth International in 1951-53 (see “Genesis of Pabloism”, Spartacist [English edition] no 21, Fall 1972). The Pabloite revisionists were fought by the SWP and its leader, James P Cannon, albeit belatedly, partially, and essentially on the SWP’s national terrain. In 1953, the SWP and other anti-Pabloite forces internationally — centrally the SLL and the French Organisation Communiste Internationaliste (OCI) — split from Pablo and shortly thereafter founded the International Committee (IC). But with the Cuban Revolution the SWP embraced Pablo’s revisionism and carried out a “reunification” with his supporters. The RT opposed this reunification with the International Secretariat of Pablo and Ernest Mandel that was to result in the United Secretariat (USec). The British section of the IC — Healy’s SLL — also opposed reunification. The founding cadres of the Spartacist tendency were impressed from a distance by the SLL’s formal orthodoxy, represented for example by its powerful 1961 document, The World Prospect for Socialism and initially stood in political solidarity with the IC. Our comrades were unaware at that time of Healy’s methods and his grossly opportunist adaptation to the Labour Party “lefts” which belied his professed “anti-Pabloite” credentials. However when our comrades argued at a 1966 London conference sponsored by Healy that “Up to now, we have not done very well, in our opinion, in smashing the Pabloites”, Healy expelled them over a trivial organisational matter. Soon afterwards the Healyites embraced Mao’s Red Guards during the “Cultural Revolution” — a violent intra-bureaucratic struggle among the Chinese Stalinists — and championed the classless concept of an “Arab revolution”. The Healyites’ political banditry found full flower in, among other things, their conciliation of oil-rich Arab despots, their despicable hailing in 1979 of the execution of 21 Iraqi Communist Party members by the Ba’athist regime and their anti-communist provocations against Arthur Scargill on the eve of the 1984-85 miners strike. Healy’s organisation imploded spectacularly in late 1985 not long after that strike ended. The SWP in the US spiraled into outright reformism in late 1965 when it jettisoned any remnants of a proletarian class fight against the Vietnam War in favour of seeking a bloc with pacifists and Democratic Party liberals in a classless “peace” movement. This organisation long ago explicitly repudiated Trotskyism. Meanwhile the centrist USec pursued one after another substitute for a conscious Trotskyist vanguard, adapting to, rather than combating, prevailing petty-bourgeois consciousness and frittering away a generation of would-be Marxist revolutionaries. In the late 1970s, along with the rest of the fake-Trotskyists, the USec embraced the imperialist anti-Soviet crusade for “democracy” and “human rights” led by US president Jimmy Carter. The Soviet Red Army intervention in Afghanistan in December 1979 against the woman-hating, anti-communist Islamic reactionaries of the mujahedin posed the Russian Question point blank and was an acid test for the left internationally. The imperialists massively ratcheted up their drive to war against the USSR and under the pressure of Cold War II, groups like the USec and the WSL howled with the imperialist wolves, giving the lie to their formal claims to Soviet-defencism. The correctness of the TF’s struggle for the Trotskyist programme of the Spartacist tendency and its rejection of the Labourite politics of the British fake left is shown in the subsequent history of those groups, particularly under the impact of Cold War II. They supported every opponent of the Soviet Union, particularly Polish Solidarność, the spearhead of capitalist counterrevolution in Eastern Europe. In the early 1980s the WSL and the USec’s British affiliate, the International Marxist Group pursued Pabloite “entry” work in the Labour Party. Like all Labourite pseudo-Trotskyists they supported Boris Yeltsin’s counterrevolution in Moscow in 1991-92, a defeat of historic proportions for the working masses of the world. Today, the reformist left cheers on the CIA-backed Dalai Lama and the “Free Tibet” movement against the Chinese deformed workers state. The erstwhile IMG and WSL eventually merged and are now known as the International Socialist Group which operates inside George Galloway’s Respect coalition, a popular-frontist alliance with Muslim politicians that makes no pretence to being a working-class formation and has renounced socialism, secularism and even the abolition of the monarchy! The Spartacist tendency uniquely carried out Trotsky’s injunction to his supporters, to stand on the last barricades in defence of the USSR against capitalist counterrevolution. We said “Hail Red Army!” in Afghanistan and “Extend the gains of the October Revolution to Afghan peoples!” We fought with all our might to defend the workers states, notably through our intervention in the unfolding political revolution in East Germany in 1989-90 and later fighting counterrevolution in the USSR itself. We continue to stand for the unconditional military defence of the remaining deformed workers states — China, Cuba, North Korea and Vietnam — against imperialism and internal counterrevolution, and for proletarian political revolution, as an integral part of our struggle to reforge the Fourth International which alone can lead the workers and oppressed to new October revolutions. 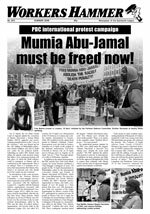 Mumia Abu-Jamal must be freed now! Northern Ireland: Socialist Party champions former H-Block warden turned security guard! Security guards out of the unions!